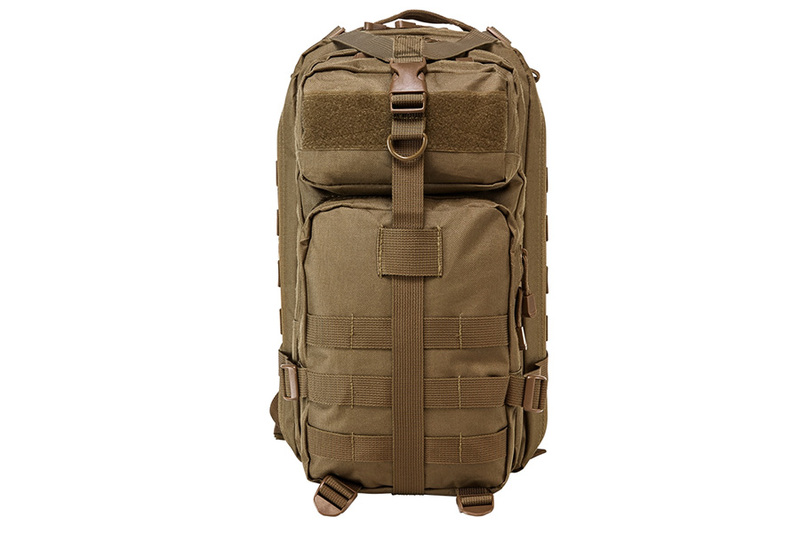 VISM Tactical Backpack, Compact size, Tan, New. VISM Tan Compact Backpack with a Main zippered compartment of 669 cu. in. of space, with an internal zippered pocket, plus a middle zippered compartment of 330 cu. in. of space, with three internal pockets. The Top front pocket (70 cu. in) has a loop fastener strip on the outside for name tapes and/or moral patches. The Bottom front pocket (175 cu. in.) and the sides of the backpack have MOLLE compatible webbing to make the Small Backpack a modular system. The backpack also has a large Padded Hydration Bladder compartment on the back with a hook and loop enclosure. Practical size, bag torn on first use along seam.